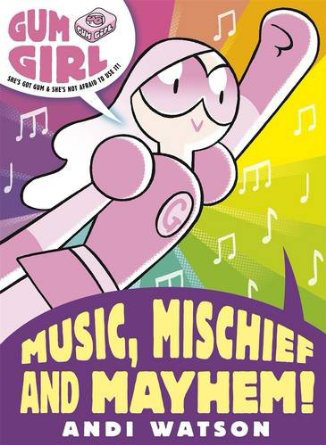 Gum Girl blog: Gum Girl book 4: Music, Mischief and Mayhem! Gum Girl book 4: Music, Mischief and Mayhem! Yup, it's that time of year again. 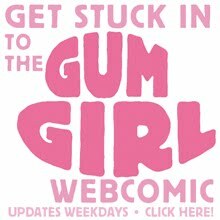 Schools are breaking up for the holidays, the sun might be shining and a new Gum Girl book is released! The town of Catstrophe has been infiltrated by three ne'er do gooders once again! In the first story a mime artist has cast a balloon of silence preventing any noise whatsoever - no music, no laughter, no bird song. Mime man has wiped out all the good noise as well as the bad. So Gum Girl retaliates in super gummy style! In a second adventure Grace notices that all the colour is draining out of objects (including herself!). Bemused and alarmed, she follows the disappearing trail of colour to none other than ... Pigment Princess! The outrageous Pigment P wants to control the colour scheme of all in Catastrophe! Someone has to stop her! And at a Fancy Dress Day at Calamity Primary, the school is sabotaged by Stick Man - an ex-counterfeiter of banknotes who accidently slipped into the photocopier during one of his scams and became who he is today. His special skill: copying himself. His mission? to erase all individuality. Gum Girl has her own ideas about everything becoming the same and sets about wiping out his crazy plans. As usual I'll be posting behind the scenes art and other goodies in the lead up to the release. See you tomorrow! Gum Girl: Music, Mischief and Mayhem! Book 4. Colour Clash Page 2.